Donut catering in Houston allows you to treat your organization to delicious and gourmet bakery items. Shipley Donuts, with locations Downtown and in Westheimer, has corporate catering packages that are ideal for school, church, and business functions. With convenient delivery and pickup options, you’ll be able to delight your staff with a wide array of delectable treats. To take the guesswork out of calculating what to order for your organization, Shipley Donuts has compiled several pre-designed packages featuring all of their best menu items. Packages are available that serve anywhere from 10 to 50 people. The most popular menu choices are included in each package such as assorted donuts, snack-sized kolaches, large coffee urns, coffee condiments, juices, and water. Although packages are the easiest way to order for ten or more people, you can also include a la carte items. Kolache poppers can be ordered by the pan while donut holes come in trays that include a minimum of 216 pieces. Fruit trays featuring seasonal fresh cut fruit can be added to any order as a healthy accompaniment. Donuts are a must-have stable for your event order. Shipley Donuts was established in 1936 and has been delighting residents and visitors alike ever since with their 60 donut varieties. Most businesses make it a point to include the most classic and beloved donut flavors: glazed, chocolate glazed, cream-filled, and iced. Kolaches appeal to fans of more savory breakfast goodies with fillings including sausage, peppers, cheese, and ham. For catering orders that include beignets, customers can enjoy this New Orleans style pastry topped with a generous amount of powdered sugar. 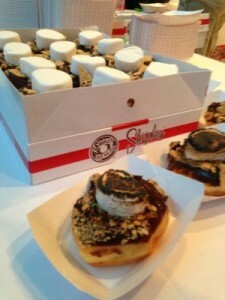 Although breakfast catering is most popular, Shipley Donuts has box lunches as well for events. Each box lunch includes a kolache with the filling of your choice, a bag of chips, a soda, and a donut. Box lunches are reasonably priced and includes enough food to satisfy the most ferocious of appetites. Above anything else, donut catering in Houston through Shipley Donuts is affordable. You won’t have to pay excessive amounts to feed everyone within your organization. And there’s little doubt that anyone will leave hungry after you provide catering through Shipley Donuts. Delivery requirements are minimum with organizations only having to place orders equaling $35 or more. There isn’t a lot of advanced planning involved in organizing a corporate catering even when using Shipley Donuts as your provider. The company only requires a minimum of one day’s notice to place a catering order. Donut catering orders can be completed online through the simple form available on the Shipley Donuts website. Prices are listed next to each available menu items and you can easily customize your orders. Don’t be afraid to think outside the box on when to use Shipley Donuts. Fans of the brand have been delighted to serve the bakery’s donuts during a range of special events from showers, birthday parties, and even weddings. Shipley Donuts will work with you one on one to create a memorable donut display that your guests will be talking about long after the event is over. Let Shipley Donuts take care of all your donut catering needs. Your staff will appreciate being able to start their workday with fresh and delicious donuts from an area favorite. Don’t forget to follow the shop on Facebook and Twitter and sign up for the monthly newsletter. The Houston bakery also offers a very special gift for customers who take part in their birthday club. Give Shipley Donuts a call at (713) 589-3292 or fill out our short form for delicious donuts today!